I shall begin by asking you to indulge me some venting: I hate the direction that many high-end preamplifiers and integrated amplifiers have taken the last quarter-century and longer—detest is a more precise word. Minimalism, along with its synonym, “purity,” has conditioned the thinking behind so many control units with pretentions to state-of-the-art status that the use of the word “control” must surely be ironic, if not downright cynical. At its most extreme this minimalism eliminates everything except a volume pot and a thimbleful of inputs, not to mention any active circuitry except preamplification in its most basic sense, a development that has had two unwelcome consequences. Routine system checks and troubleshooting become effectively impossible or at best very cumbersome, while the absence of balance and tone controls eliminates any means of addressing the tonal and channel-to-channel imbalances that exist in many recordings and listening environments, even some very good ones. How many audiophiles, I wonder, have rooms in which the loudspeaker of one channel “sees” the same frontal space or is reinforced by the identical side and rear boundaries as its mate (L-shaped rooms, anyone)? This is just one instance of speaker/room interface that undermines channel balance, even when the signal arrives at the speakers in perfect balance, which is by no means always the case. It might come as a surprise to many audiophiles to discover their speakers are not sonically identical. Go to some of the publications and Internet sites that reliably measure these things and you might be shocked by the number of models, including even extremely expensive, highly reviewed ones, that differ as much as 3dB from unit to unit, a difference audible during critical listening and easily audible when the music isn’t complex (e.g., solo instruments or voices). And surely it isn’t necessary to point out that correct stereo imaging and soundstaging are crucially dependent upon accurate reproduction of the relative levels of one channel vis-à-vis the other. As for source material, remember that level differences are additive. Except on pure tones, nobody can hear an imbalance of, say, 0.5dB, but if this imbalance comes up against one in another component that is off by the same amount, then you have an imbalance of 1dB, which in turn will be added to any others along the recording, mixing, and mastering chain all the way down into your own system and room, which will contribute their own. Fortunately, these small imbalances often have a way of cancelling themselves out, but not always, and the problem is more prevalent in analog, specifically vinyl. Not all designers have gone along with this trend. Dan D’Agostino, whose high-end bona fides are surely beyond any doubt, struck a welcome blow both for sanity and for the primacy of musical values by putting bass and treble tone controls (in addition to balance) on his state-of-the-art Momentum preamplifier and integrated amplifier. “I wanted them for myself and all the other real music lovers,” he recently told me (it’s an indication of how ingrained this shibboleth of audio purity has become in our time that at least one reviewer did not so much as mention this feature in his review of the preamp—absent the accompanying photographs, his readers wouldn’t know the unit had them). Both Luxman and Anthem market models with a full complement of functions, including either built-in phonostages or the option for them. And the late James Bongiorno, who believed that tone controls were necessary to address the response anomalies of virtually all domestic listening spaces, put them on his statement preamp, the Ambrosia, and also on his budget-conscious Thoebe II, with absolutely no penalty in transparency that I could discern (see my review, Issue 263). But above and beyond, not to mention long before any of these, stands one of the founding pioneers of consumer audio, a company which, throughout its nearly seventy years distinguished by some of the finest high-end equipment ever made, has always mediated innovation and tradition, embracing new technologies while steadfastly retaining traditional functions and features necessary for the playback of music in the home: McIntosh. 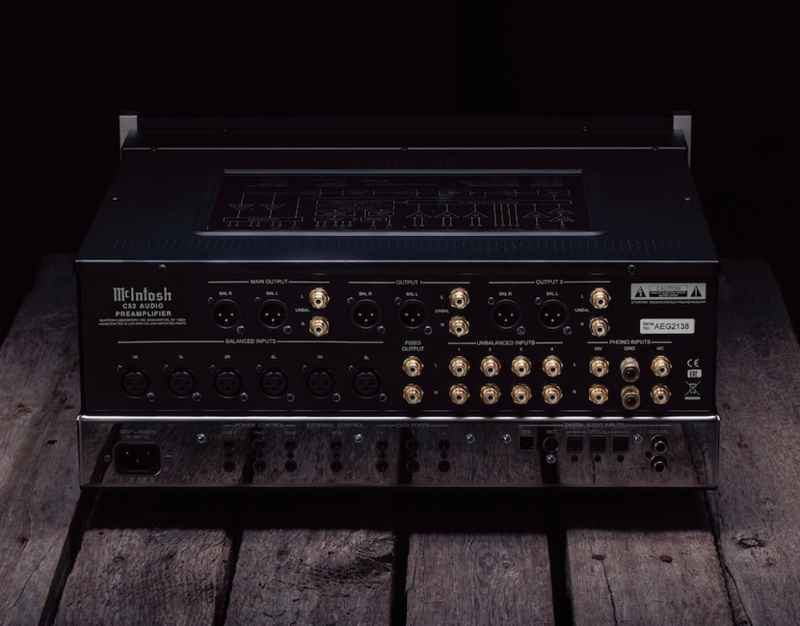 McIntosh’s C52 preamplifier, which the company calls “the most advanced, single-chassis solid-state preamplifier we’ve ever made,” could serve as a textbook of what a high-end control unit should be. In addition to the usual volume, muting, balance, and stereo/mono functions, it has an eight-band equalizer; three balanced and four unbalanced analog inputs; and two separate phonostages with dedicated inputs for moving-coils and moving-magnets. The versatile DAC section, with seven inputs (one USB, two coaxial, three optical, and a proprietary port for McIntosh transports and players), accommodates almost every digital format and piece of hardware the consumer is likely to use. A built-in headphone amplifier features McIntosh’s “Headphone Crossfeed Director” (HXD), a proprietary circuit (defeatable if desired) said to improve the headphone experience by restoring “the directionality component of the spatial soundstage normally experienced with loudspeaker listening.” Rounding out the connections are three balanced and three unbalanced outputs, plus trigger and data ports that allow it to operate associated McIntosh gear (it will also operate the on/off trigger ports of other manufacturers’ amps). Yet for all its multi-faceted functionality, versatility, and connectivity, the C52 is so ergonomically impeccable and user-friendly, the layout of its knobs and buttons so clean, logical, intelligent, and attractive that I had it unpacked, connected, and playing music without even cracking the manual. But crack it you must if you’re to take full advantage of all it does (like all manuals from this manufacturer, its clarity and thoroughness are exemplary and it’s copiously illustrated). A few examples: equalizer on/off settings can be saved independently for each input; a trim function sets different output levels for each input to eliminate sudden volume jumps when switching from one source to another; custom names can be assigned to the inputs; unused inputs can be deleted from the menu, obviating the need to cycle through so many to get to those you use (of course they are restorable as needed); a wide range of capacitance for moving-magnets and impedances for the moving-coils is available (though somebody missed a trick by not having the selected values appear on the display when the inputs are engaged). All this and more are accessible or doable via the remote handset. And as ever with this manufacturer, everything works flawlessly, all switching and push-buttons completely silent, knob action smooth and swish-free, channel-to-channel volume tracking exact, and output levels helpfully displayed as a percentage from 0 to 100 (thus when doing comparisons you can easily return to a previous level, provided you took note of its numerical readout). There is obviously way too much on offer here to cover everything in a single review, even a long one. Though LPs, CDs, and SACDs constitute my primary listening media, the C52’s ready ability to accommodate so many digital formats finally pushed me to plunge into the brave new waters of online streaming services, player applications, and libraries. Before proceeding, gratitude is due three gentlemen who exhibited the patience of Job in guiding me through the far from intuitive (at least to me) setup, navigation, operation, and troubleshooting of these applications (why do none of them provide any clear instructions? ): Philip O’Hanlon (of On a Higher Note), Steven Stone (my colleague here at TAS), and Ron Cornelius (McIntosh’s project manager). David Chesky generously supplied downloads in different formats from HDtracks.